Another sow�s ear to silk purse project! It�s been a while and I�m glad to see you back. I have a couple Mainline Models HO kits; every so often I get them out, shake my head, mutter to myself �why do I have these� and put them back on the shelf. Maybe I need to see somebody do some magic on one. Ok, repaired the broken bits and added some lead to the interior while it was open. Started in on making the sides. 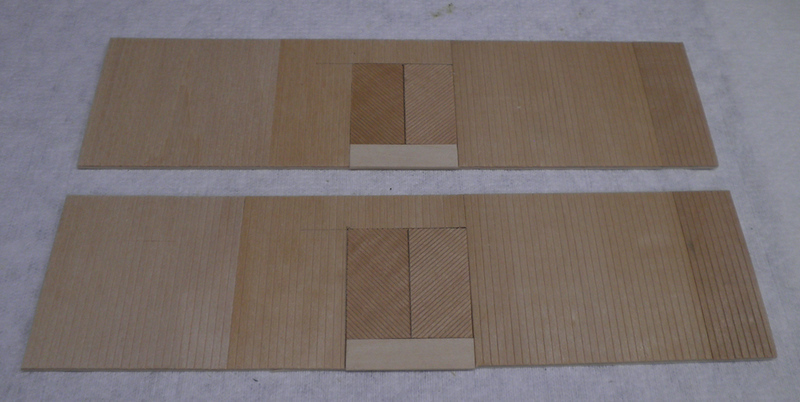 Some 1/32" basswood cut to fit each side. Center for reefer doors and those were made up from some 1/32" scribed siding cut at 45 degrees. Size was decided by the reefer door hardware that I have available. Now ain't that something...just this morning I did a woodworking project and marked the boards A and B, in pencil, to designate what side they were cut to fit. Small world afterall. Diagonal scribed siding is such a nice feature. Yeah, I like it and it gives the car a distinct look. If I'm going to invest the time to rebuild/recreate, then I'm going to add a few little touches like this - does cut into my stock of that siding, but if that stuff sits on the shelf unused then I've forgotten why I bought it. Got the barn wood project completed but the shop is under a cloud of very old oak and bit of walnut - an extended shop vac exercise it next on the schedule of events. One side and most of both ends pretty close to completed now. Other side to do and then it's some paint on the underbody and all the bits for the roof. Bit of progress on the roof; pretty much done now. Moving right along. Must be expedited service. Should have the paint done today and get a few remaining details added and painted. Might be able to get into the dry transfers tomorrow......if it's raining still and I'm stuck at home.......again. Love those big hatch platforms. Shaping up nicely. Here's to a rainy day! Those Clover House dry transfers really provide a great finish. Not the easiest to use - you apply colors in sequence sealing in between, but they do add up to make a nice and interesting lettering appearance. Clover House is pretty much my go to source for lettering car that I end up rebuilding to this extent. Worth the effort, all the way. Terrific!